Henry Armstrong — possibly, in the 1900 census of Toisnot township, Wilson County: farmer Nelson Armstrong, 45, wife Mary Ann, 40, and children Mamie, 15, Hattie, 13, and Henry, 12. Newspaper reports reveal a strike (or series of strikes) by African-American brick masons in Wilson in the first decade of the 20th century. Though the record is sparse, these articles offer rare glimpses of black workers flexing their economic muscle, and surprising hints of the reach of organized labor during a time and place well-known for hostility toward unionization. Wilmington Messenger, 21 October 1902. Brickmasons led by Goodsey Holden struck for a nine-hour work day consistent with that required by “the International union.” The protest, at least temporarily, resulted in concessions from the contractors for whom they worked. News & Observer (Raleigh, N.C.), 2 April 1903. Six months later, bricklayers struck again, crippling progress on the construction of several large brick commercial buildings, including Imperial Tobacco’s new stemmery. Contractors brought in nearly 20 masons from Raleigh and Durham to pick up the work. The sub-headline suggests that the men refused to cross picket lines once they arrived in Wilson, but the article does not address the matter. Masons in those cities were also engaged in strike activity. Greensboro Daily News, 18 March 1906. Three years later, Will Kittrell was arrested and charged with conspiracy and blackmail for allegedly warning a Henderson brickmason to leave town. Contractors continued to import masons from across North Carolina to fill the gap created by Wilson workers’ refusal to work without limits on long workdays. 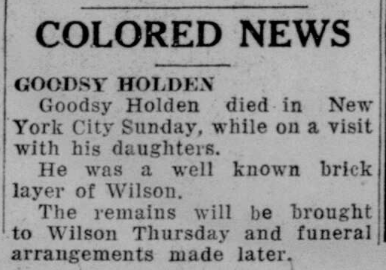 Goodsie Holden — Well-known brickmason Goodsey H. Holden appears to have arrived in Wilson in the late 1890s. Will Kittrell — William Kittrell was an Oxford, North Carolina, native. 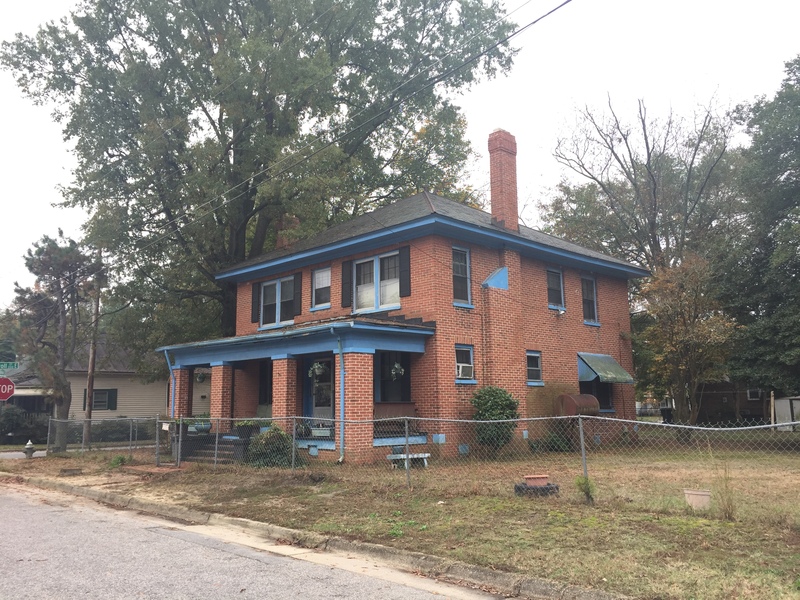 The twenty-first in a series of posts highlighting buildings in East Wilson Historic District, a national historic district located in Wilson, North Carolina. As originally approved, the district encompasses 858 contributing buildings and two contributing structures in a historically African-American section of Wilson. (A significant number have since been lost.) 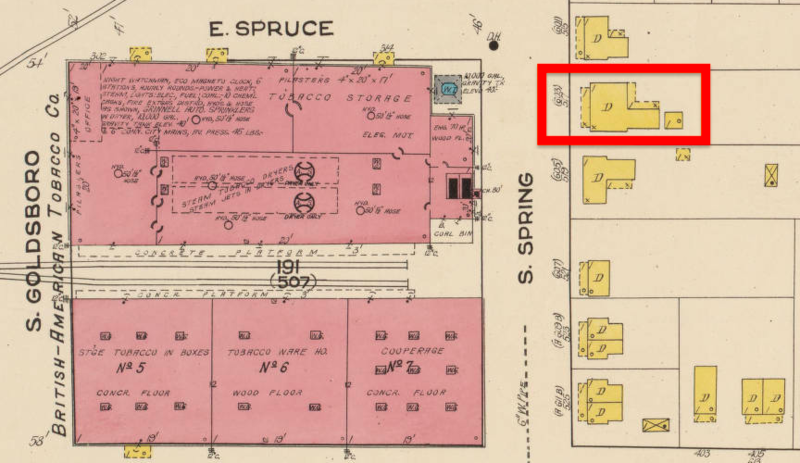 The district was developed between about 1890 to 1940 and includes notable examples of Queen Anne, Bungalow/American Craftsman, and Shotgun-style architecture. It was listed on the National Register of Historic Places in 1988. This home has been continuously occupied by the family since its construction. For more about Benjamin A. Harris Sr., see here. Photo taken by Lisa Y. Henderson, May 2017. Snaps, no. 11: John M. and Annie D. Barnes. John M. and Annie D. Barnes. The building behind them appears to be Mercy Hospital. They lived next door at 500 East Green Street. Per the article, John Barnes was born 26 December 1870 in Edgecombe County to Charles and Rebecca Barnes. (Benjamin Frank Barnes was one of his brothers.) He married Annie Darden and fathered four children, Leonard Elroy, Artelia, Thelma, and John William, who died in infancy. Annie Darden Barnes taught at the Sallie Barbour School. Barnes was a master builder, carpenter and brickmason whose finest works included Saint John A.M.E. Zion church and parsonage, Camillus L. Darden‘s stately Colonial Revival home on Pender Street, and the Tudor Revival Darden Funeral Home on Nash. He was devoted to Saint John and served as violin soloist, steward and trustee during his 69 years of membership. In his spare time, he raised Rhode Island Red and Plymouth Rock chickens at his home at 500 East Green Street. When Annie Barnes died, Barnes built a brick and cement mausoleum for her remains. John M. Barnes died 27 April 1958 and was buried in an extension of the mausoleum built by his friend George Coppedge. Barnes mausoleum in Darden family plot, Rest Haven cemetery, Wilson, February 2017. In the 1900 census of Wilson, Wilson County: farmhand Charley Barnes, 50; wife Rebecca, 57, washing; and children John, 26, drayman, William, 23, drayman, Annie, 17, cooking, Tom, 18, day laborer, and Corrah, 12, nursing. On 22 December 1903, John M. Barnes, 33, son of Chas. and Rebecca Barnes of Wilson, married Annie Lee Darden, 24, daughter of Chas. and Dianah Darden of Wilson. Samuel H. Vick applied for the license, and Methodist Episcopal minister B.D. McIver performed the service in the presence of C.R. Cannon, Walter Hines, and O.L.W. Smith. In the 1910 census of Wilson, Wilson County: brickmason John M. Barnes, 44, wife Annie L., 32, Leonard E., 5, Lee J. [Leo Artelia], 4, Selma [Thelma] F., 2, and John W., 3 months. In the 1912 Hill’s city directory, John M. Barnes, bricklayer, is listed at 121 Pender Street (across from Saint John A.M.E. Zion.) In the 1922 and 1930 city directories, he is listed at 500 East Green. His occupation was given as plasterer in 1922. In the 1940 census of Wilson, Wilson County: at 500 East Green, bricklayer John M. Barnes, 69, and wife Annie L., 61. Annie Lee Barnes died 3 May 1943 at Mercy Hospital in Wilson. Per her death certificate, she was born 1 February 1879 in Wilson to Charles Henry Darden of Greene County and Dianna Scarborough of Wilson County; was married to John M. Barnes; and taught at the Sallie Barbour School. John M. Barnes was informant. John M. Barnes died 27 April 1958 in Wilson. 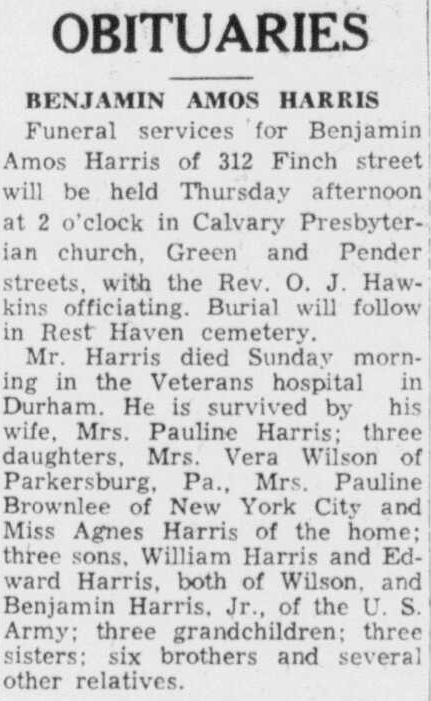 Per his death certificate, he was born in 1870 in Wayne County to Charles and Rebecca Pope Barnes; worked as a brickmason; was married to Cora Sherrod Barnes [daughter of Jack and Cassie Sherrod]; and was buried at Rest Haven. Thelma B. Byers was informant. Photo of John and Annie Barnes courtesy of History of Wilson County, North Carolina (1985); cemetery photo by Lisa Y. Henderson, February 2017. “Oliver Nestus Freeman (February 22, 1882-September 28, 1955) was a prolific, creative, and multi-talented craftsman active in Wilson from about 1910 to his death in 1955. He became the community’s preeminent brick and stonemason and also worked in tile, but he is best known for his stonework on his own buildings and throughout the community. “Born in rural Wilson County, the son of Julius Freeman, a carpenter, and Eliza Daniels Freeman, Freeman was educated at the Tuskegee Normal School where he majored in industrial arts. 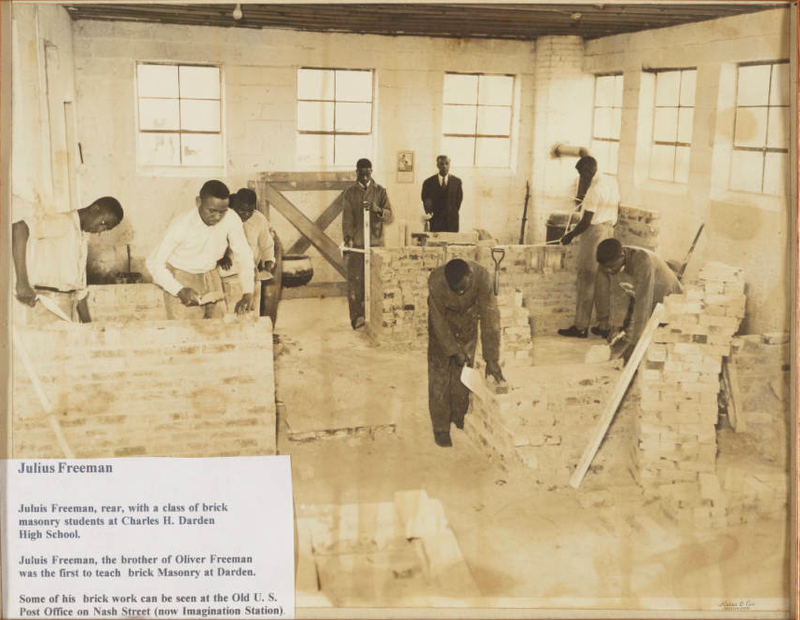 Training and experience in construction, including masonry work, constituted an important part of the Tuskegee program. As a young man, Freeman taught at Tuskegee and later at the Wilbanks School in Wilson County. He married Willie May Hendley, originally of Nashville, Tennessee, whom he met at Tuskegee. The Freemans became friends with both Booker T. Washington and George Washington Carver through the Tuskegee connection. 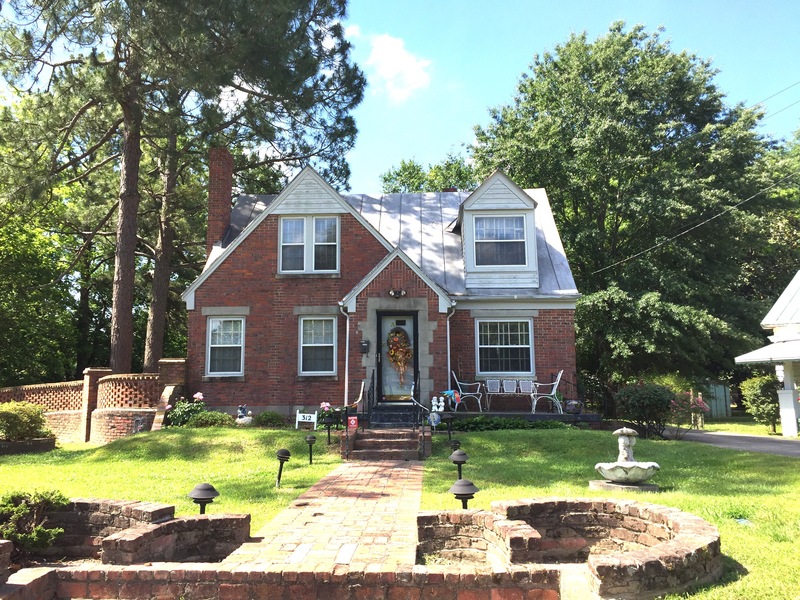 The couple settled in Wilson about 1910, and there Freeman constructed a modest brick house at 1300 East Nash Street, where they raised four children, and which has remained in the family. “Freeman identified himself to the census takers of 1910 and 1920 as a brickmason, but he was skilled at all types of masonry work. Especially distinctive is his bold, rough stonework for foundations, chimneys, columns, and other architectural elements throughout Wilson, especially for the city’s many fine bungalows. Besides his work on buildings, he created imaginative masonry sculptures that enhance many Wilson gardens. Another of Freeman’s buildings — Our Redeemer Lutheran Church, 612 Vance Street NE, Wilson. Photo of Freeman courtesy of www.digitalnc.org; photo of church taken by Lisa Y. Henderson in May 2016. Instruction that would prepare us for a useful life. Pittsburgh Courier, 3 June 1911. Julius Franklin Freeman Jr. (1888-1960) was the son of Julius F. and Eliza Daniels Freeman. Noted stonemason Oliver Nestus Freeman was his older brother. The family appears in the 1900 census of Wilson, Wilson County: 56 year-old carpenter Julius Freeman, wife Eliza, 46, and children Elizabeth, 19, Nestus, 17, Junius, 11, Ernest, 9, Tom, 6, Daniel, 4, and Ruth, 4 months. Freeman was a long-time vocational education teacher at C.H. Darden High School in Wilson. The photograph below is part of the collection at the Freeman Roundhouse, the East Wilson museum housed in one of Julius’ brother O.N.’s constructions.